Aircrafts flying parabolic trajectories have provided an important milestone in space exploration and research during the past 50 years. Parabolic flights are the only manned research platform in weightlessness where scientists are able to conduct their experiments themselves. With thousands of experiments in the last decades, parabolic flights are the backbone of microgravity and spaceflight research and technology development. Parabolic flights are the basis for every manned spaceflight program – until today. During a parabolic flight maneuver an aircraft is weightless by flying on a “Keplerian trajectory”, which is described as an unpropelled body in an ideally frictionless space subjected to a centrally symmetric gravitational field. During this free-fall trajectory, the resultant of all forces acting on the aircraft other than gravity is nulled. An entire scientific parabolic flight campaign usually consists of three individual parabolic flights with 31 respective parabolas in sequence. Novespace, subsidiary of the CNES, founded in 1986, owns and operates the Airbus ZERO-G. Novespace organizes in-flight tests and research activities for worldwide customers mainly on parabolic flights. For more than 15 years, Novespace has been organizing over 110 parabolic flight campaigns on board the A300 ZERO-G for international space agencies (CNES, ESA, DLR, JAXA), for technological investigations and scientific research. After 17 years of loyal service, the European workhorse for microgravity research on parabolic flights, the Airbus A300 ZERO-G, was retired at the end of October 2014. The Airbus A300 was the world´s largest airplane used for gravity research. The success of this aircraft is supported by the long list of customers which includes ESA, CNES, DLR, JAXA, industrial customers and private commercial flights. The A300 offered hundreds of international resear­chers access to weightlessness and reduced-gravity for experiments and investigations in simulated lunar and martian gravity. The successor aircraft is the Airbus A310 “Konrad Adenauer” from the German Air Force, previously used by the German government for official travel and diplomatic business. 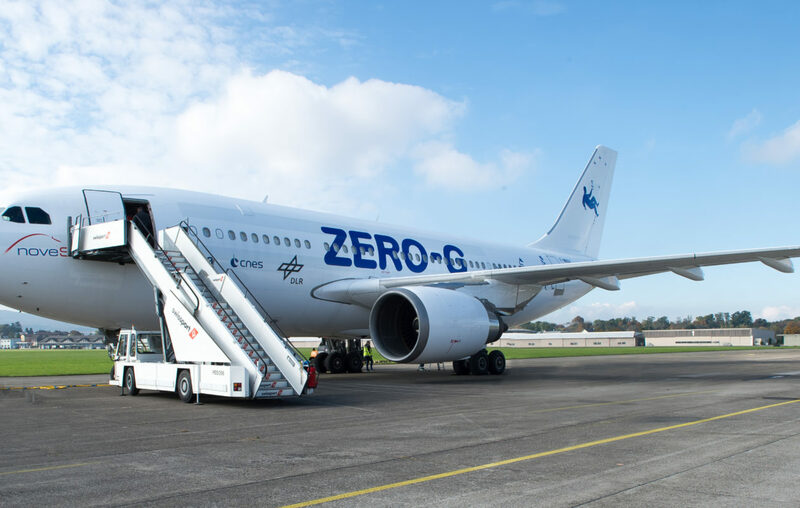 In summer 2014, the new A310 (Airbus ZERO-G) successfully flew its qualification flights from Bordeaux-Mérignac airport and is now regularly utilized for scientific and touristic parabolic flight campaigns. The A310 was modified by Lufthansa Technik and underwent final qualification with the European Aviation Safety Agency and the French Civil Aviation Authority. CNES, ESA and DLR are the main partners and users of the parabolic flight program. Benefits generated by other flights help to fund European microgravity research. Novespace relies on recognized European maintenance organizations and on experienced crew.